I’ve made many a crisp in my day. And by many, I really mean too many. You name the fruit, I’ve probably made the crisp. Well, except not with pomegranates. Thinking that wouldn’t work out so well. And yes, I said create. This is the key to get that great dark brown caramel bubbling over the outside of the crust. It was so ooey-gooey good! And another way you can use up that abundance of apples…Slow Cooker Applesauce! I’m sharing the how to over at SCJohnson’s Family Economics Food for Thought blog. Preheat the oven to 375. Lightly grease a 9×13 glass baking dish. Prepare the apples. In a medium saucepan, cook the brown sugar, butter/margarine and lemon juice. Bring to bubbly, then reduce heat and stir until sauce darkens. Add the cinnamon. Then toss in the prepared apples. Then place into the prepared baking dish. In a mixing bowl, combine the flour, brown sugar, cinnamon, allspice, nutmeg and salt. Cut in the cold butter/margarine, until little crumbles form. Sprinkle the topping all over the caramel sauce coated apples. Bake in the preheated oven for about 50 minutes, or until apples are tender, sauce is bubbly and thick, and topping is golden. 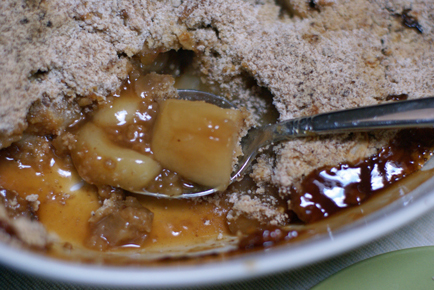 Serve Caramel Apple Crisp with whipped cream or vanilla ice cream. Yum! Sounds perfect for this cold weekend. Caramel is a weakness for me, and something I don’t often get to have since we are a dairy free house. This is absolutely going into my meal plan for next week! In regards to applesauce, I make mine a super easy way. Peeled cored apples and some water in a large pot. Cook until they are all mushy, adding water as needed so nothing sticks. Once they are all cooked down I add a bit of lemon juice, then puree with a stick blender. I have bags and bags of it in my freezer for my 2 applesauce junkies. I get big boxes of less than perfect apples at the farmers market for a lower price which makes it super affordable. Much cheaper than buying jars, and no added sugar! I have to thank you for posting this, it looks delicious and is going to be part of my Thanksgiving Pot Luck Dinner. Thank you OVER and OVER for putting dairy-free or easy to adapt to dairy-free desserts on your site!! My daughter will be SO excited!! I make crisps myself. Easier than pies. My mom made them alot too. I make berry crisps as well. I will have to try this one. I helped make caramel corn and apples at our church harvest festival on Sunday evening. Cindy had Peggy and I help with that from a recipe of brown sugar, butter, evaporated milk and vanilla. It was drizzled over the popcorn and the apples, yummy! Better tasting than the use of caramel candy that you melt! This was Cindy’s grandmother’s recipe. Can you give me the exact measurements for the caramel sauce you used for popcorn? Thanks. I will definitely be trying this-my family and I will love this! I had some apples to use up Friday and made this. It is the best Apple crisp I have ever had. I didn’t have either ice cream or whipped cream so I poured some cold milk over the top. Yum..I don’t think it could be any better. Thanks for the recipe. So I just made this and Well its baking and smells amazing however didnt have nutmeg but i used a bit of saigon..lets see how this comes out. It was pretty easy to make and the crust was easy but i did have difficutly on the consistancy. But ill see if i made it right in about 30 min. thank you, my hubby is a HUGE fan of caramel desserts…Now all i need to learn how to make is the bread pudding. Made this last Tuesday and everyone ate it! I could have eaten the whole thing it was so great! I wish I had Vanilla ice cream to go with it. thank you! I love this recipe! I’ve made it about 4x in the past few weeks with apples being so cheap. I’m making two for Thanksgiving today: one to take to each of our families.